A team of engineering students will perform on-site assessments aimed at helping manufacturers learn to use energy more efficiently. The assessments will also give the students training in energy management and manufacturing processes. A team headed by three Nebraska Engineering faculty has been awarded a US Department of Energy (DOE) grant of more than $1.4 million to help small manufacturers use energy more efficiently and train engineering students in energy management and manufacturing processes. In mid-December, the DOE's Office of Energy Efficiency and Renewable Energy announced the University of Nebraska-Lincoln as one of eight new Industrial Assessment Centers (IAC) that join 20 existing IACs in the program. The directors of the Nebraska IAC will be Robert Williams, associate professor of mechanical and materials engineering, Bruce Dvorak, professor of civil engineering and George Gogos, professor of mechanical and materials engineering. IAC teams of faculty and students will perform on-site assessments at small- and medium-sized manufacturing business partners – defined as having gross annual sales below $100 million, fewer than 500 employees, and annual energy bills between $100,000 and $2.5 million. In exchange for hosting the hands-on assessment training opportunities, these manufacturers receive an assessment report that the company can use to improve productivity, secure information, reduce waste and save energy. 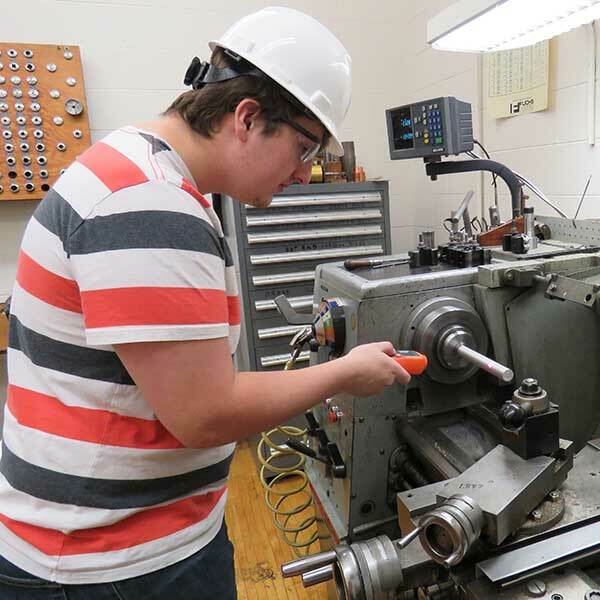 Undergraduate and graduate engineering students will receive training in manufacturing processes, energy assessment procedures and energy management systems. The Nebraska team began its IAC work a few months before the DOE announcement, and with experience in the Partners in Pollution Prevention (P3) program, Williams said, the Nebraska IAC is already experienced in these types of assessments. "Honestly, my partners and I have been planning for this for five years," Williams said. "We've been using a slightly different model than the IAC, with students placed in summer internships at similar facilities, but we now have at least four undergraduates with experience in this field." Matt Thompson, a graduate student in environmental engineering who has been involved with Dvorak on projects, says the IAC will provide invaluable professional experience for himself and other students. "It is the most practical as far as getting a learning experience," Thompson said. "If you're in any kind of discipline that requires you to understand processes in general, this will be a great opportunity to see what's out there (career opportunities) and to see specifically how you can apply your engineering concepts that you learn in school to real-world solutions." In addition, the IAC program has grown to offer newly expanded services and encouraged applicants to propose creative approaches to providing IAC services in the areas of Innovative "smart" manufacturing; cybersecurity; water/wastewater; and energy management systems. When implemented by the company, the recommended actions will result in energy savings, potential enhancements, and related information technologies for these manufacturers at the heart of the U.S. economy. Providing help to the businesses and people of Nebraska is one reason utilities, state agencies and other groups are interested in helping with the IAC program. Among those entities working with the IAC as partners include Lincoln Electric System (LES), Nebraska Public Power District (NPPD), the Nebraska State Energy Office (NEO) and UNL's Nebraska Manufacturing Extension Partnership, headed by Curtis Weller, professor of biological systems engineering. "From a manpower and exposure standpoint, we don't have quite the reach to go out and do what they can do," said David Bracht, director of the NEO. "Like some of the companies that will benefit from the IAC, we don't have a great deal of resources. Working with the IAC, we can collaborate and really do a lot of good for Nebraska." Alan Dostal, NPPD's director of research, said the grant also provides the opportunity for both businesses and young engineers to "fill gaps" in the workforce. "It allows smaller businesses access to expertise and staff they just don't have the resources for, or if they do have the staff, those workers are too busy doing something else (to make these types of assessments)," Dostal said. "When you get fresh eyes on a topic, you have an opportunity to see something from a different way, and that's the strength of this program. It's invaluable." Williams said one of the time-tested byproducts of the IACs is developing a pool of talented engineers who are ready to work upon graduation and creating interest in those graduates. "It does provide workforce development," Williams said. "At other IACs, typically, it's common for some clients to want to hire team members. That can keep more talented people that we've educated working in our state." Williams also said having an IAC will likely allow the university to expand its energy sciences curriculum and, he hopes, could lead more engineering students getting a minor in that field. "The IAC should enhance the course offering in (Nebraska's) energy education programs, and that won't just benefit the College of Engineering or our students, but the university and the entire student body," Williams said. Locally and regionally, Williams said, the Nebraska IAC is ready to have a big impact, since the nearest IACs have headquarters in Utah (to the west), Illinois (east) and Oklahoma (south). That could require the Nebraska team to cover a large expanse of the country. "It's a huge opportunity. We could have a lot of travel and work ahead of us," Williams said. "It's probably fortuitous for both us and the DOE that we applied. Without us, there would be a big hole in the center of the map."